What’s in your camping survival kit? It can be hard to remember to take everything when you go, but having all the essentials will help in case of emergency and make any backwoods outing run much smoother. One thing you may not always think about is an axe. From chopping firewood, clearing brush around your campsite or as a useful tool in a pinch, you never know when a good hatchet will come in handy. The Fiskar is a full-length, two-handed splitting axe designed with Fiskars blade geometry and a shock-absorbing FiberComp® handle--making it virtually indestructible. With dimensions of 37.4 x 9.3 x 1.8 inches and weighing 5.8 pounds, it is not the lightest nor smallest item in your camping toolbox. It makes up for this, however, in versatile utility, and will get even your heaviest of work done--both camping and at home. 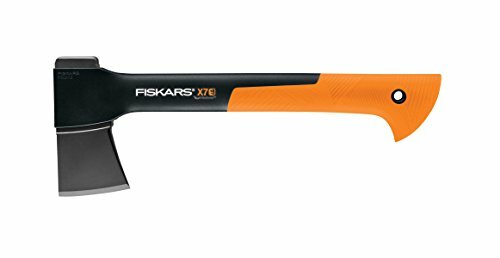 The Fiskars X27 is one of the bestselling camping axes. It also comes in 17, 23.5, and 28 inch options, so if the largest size is not what you need, you have many options for this great product. Get the Fiskars X27 if you want a top-quality, affordable axe for just about any tough splitting job. With a sturdy FiberComp® handle designed to be both strong and light. Also a Fiskars brand product, it was designed in Finland to have perfect balance and a sleek design, crucial for all your camping and backpacking needs. The Nyglass/Fiberglass blend handle is molded into the geometrically designed PermaHead blade, so it won’t break or loosen over time. The low-friction coating on the blade prevents it from getting stuck in even the toughest of woods. Much like an aluminum baseball bat, this hatchet is designed to maximize power through careful balancing. With a lifetime warranty and a non-slip grip, you will be chopping anything from kindling to medium-sized logs with ease. It also comes with a storage sheath. 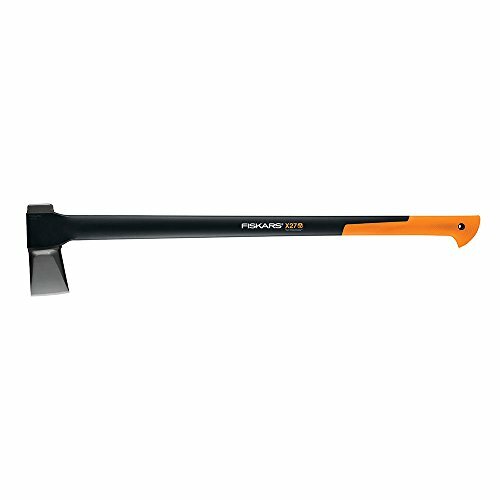 With Fiskars’ blending of quality with affordability, you will hardly find a better small-sized camp hatchet than the X7. Gransfors Bruks is renowned for producing the finest handcrafted hickory-handled axes and hatchets in the world. If you want the highest quality camping axe, stamped with the symbol of the Swedish smith that forged it, by hand, in Scandinavia, this is the axe for you. This 19 inch model is a good mid-sized option, weighing 1.5 pounds and still packable but sturdy. With a grain-leather sheath, the simple design and classic look of your Gransfors Bruk forest axe will be sure to impress you for decades to come. It consistently receives top reviews for its durability, dependability, and style. Like the Gransfors Bruks (above), the Husqvarna is simple, classic, and practical. Unlike the Gransfors Bruks, it is affordable. 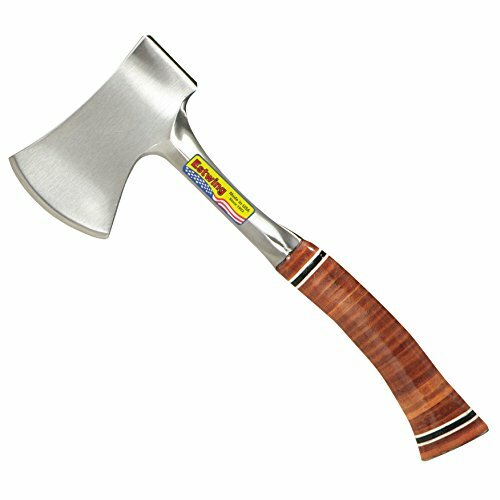 If you are looking for the same type of traditional, no-frills camping hatchet, look no further. Also forged in Sweden and sporting a Hickory wood handle, the Husqvarna curved wooden handle hatchet comes with a leather sheath. At 13 inches long, it is a small-sized hand axe for light chopping and cutting of firewood and small branches. Though not rated as highly as the others, and seemingly not as durable, it provides a low-end version that will still do the job well. Husqvarna is a brand that provides a variety of products, from chainsaws to riding mowers, and is committed to both quality and affordability. Weighing 2 pounds, your Husqvarna comes with a leather sheath for storage and will be your ready companion at any camping excursion. 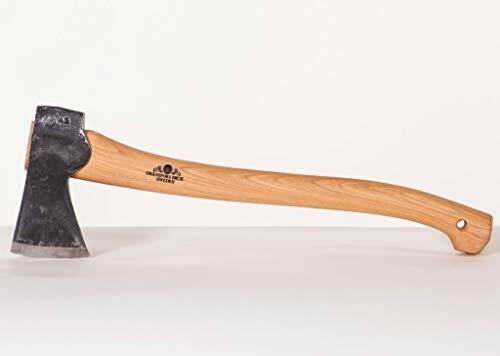 Made in Illinois, USA, the Estwing 14-Inch Sportsman’s Axe is made from one solid piece of American steel and covered with a sturdy leather grip and a nylon protective sheath. The grip is both sanded and lacquered for a smooth, comfortable finish. The blade is hand-sharpened for the best possible cutting edge and because the blade and handle are made out of one solid piece of steel you will never experience any difficulties with breaking or bending. This also allows for a narrow (3 and ¼ inch) head for quicker, more precise cutting. Weighing around 1.3 pounds, this short axe will be both light and strong, making it ideal for camping. If you are looking for an American-made product that combines simplicity with style and comfort, you will find it in the Estwing Sportsman’s Axe. 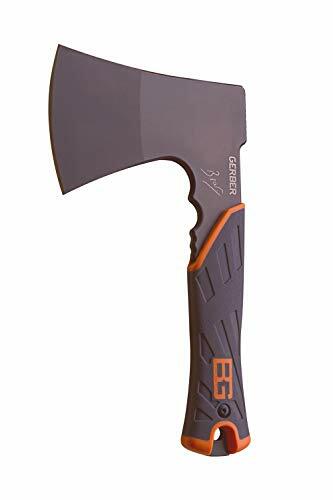 You will first want to understand the difference between an axe and a hatchet, decide what is best for your needs, and then use our compiled list of camping hatchets and axes to select the one that is right for you. Be sure to consider all cutting safety habits and techniques to make sure your camping experience is stress-free. The first thing you will want to consider is whether you need an axe or a hatchet -- each is used for different tasks. Axes are meant for heavy-duty, large-scale chopping and felling. Hatchets are smaller and ideal for kindling and firewood. Axes are long, straight, two-handed tools for heavy log-cutting and tree-felling. If you want a tool that gets the job done, get an axe. Though it will be too heavy and unwieldy for long hikes or backpacking trips, if car-side camping is your thing you will never want to leave home without a trusty axe for all your wood chopping needs. You will always want to choose an axe that is the right size for optimum balance and efficiency. This is a matter of personal preference, so do your homework and think carefully about your needs and how your axe will fill them. Consider your own height and arm length as well. Some axes have integrated handles (where the head and grip are one seamless piece) and some are grooved together. Once you know the different components of the best camp axe, you will be better prepared to choose one for yourself. Hatchets, on the other hand, are designed for smaller-scale, one-handed chopping. A hatchet is optimal for finding kindling and chopping small- to medium-sized firewood. Hatchets are also more portable, and can be carried in a backpack for long distances or looped on a belt loop. You may sacrifice some efficiency with a hatchet, but will make up for it in versatility and ease of use. There are several famous quality brands that make the best camping axes and hatchets. Here are just a few of the major ones featured in the top 10 list. By far the most popular brand in camping axes and hatchets on the web, Fiskars prides itself on its heritage of quality and innovation. Founded in 1649 in the Finnish town of the same name, Fiskars is known world-wide for quality steel products that blend form and function. Each of their product designs, from scissors to saws, focuses on improving the user experience with innovative designs and materials. Their camping axes and hatchets feature geometrically designed heads for the sharpest, longest-lasting blades, integrated smoothly into strong, light, virtually unbreakable handles. Using FiberComp® fiberglass in a thermoset polymer matrix means that you will get the lightest, neatest, most powerful swing they can give you. Fiskars axes hold both the #1 and #2 spot in our top 10 list of best-rated camping axes and hatchets, and it is no wonder. If you need a long-standing brand that combines both tradition and innovation, get a Fiskars. Gransfors Bruk is known to be the highest-priced, best-quality wood-handled brand for axes and hatchets alike. Based in Sweden, Gransfors Bruk has over a century of experience in production of handcrafted axes, focusing specifically on products with environmental responsibility. Each axe or hatchet is stamped by the smith that made it, and if you happen to be near the Swedish village of Gränsfors in northern Hälsingland you can drop by the forge and watch them in action. All Gransfors Bruk handles are made of hickory, a solid wood well known for its flexibility and strength. Because they do not make any other products, but focus solely on the nuances of axes and hatches, you are sure to receive the most specialized product possible. Your Gransfors Bruk axe or hatchet will come with a 20-year guarantee and an informational book about the process that made it. If you are looking for the finest quality axe rooted in a long history and traditional manufacturing techniques, look no further than Gransfors Bruk. Made proudly in the USA since 1923, Estwing products are dedicated to both durability and craftsmanship. Located in Rockford, Illinois, Ernest Estwing originally founded his company to market tools with leather grips, in order to provide the most comfortable and useful tools possible. From hammers to drywall, Estwing knows the tool business. 90 years later, their recent switch to nylon grips provides maximum shock absorbency and reduction of impact for the best user experience imaginable. Because they are forged in one piece, Estwing products are sure to be sturdy and reliable. If you need a classic, American-made product that blends both style and utility, try an Estwing. We hope that now you know everything you need to choose the best possible axe or hatchet for your next camping trip. As is clear, there are many options -- whether you prefer the classic quality of a Gransfors Bruks or the innovation of a Fiskars, you are now prepared to choose the best possible product for your camping needs.